Thanks to Urbanomic’s Yarnwork podcast series there’s a really wonderful in-deph interview with Norwegian crime writer Gunnar Staalesen, whose Varg Veum series is a long-running and much-beloved private detective series that gives the American PI tradition a Nordic twist. Though there were not a lot of private eyes at work in Norway when the series started in the 1970s, this character was able to solve the kinds of crimes that fit Norwegian society from then to the present, winning a pasionate audience. It’s delightful to hear from the author and also to hear him read from his books. Brilliant. Jørn Lier Horst is joining the group blog, Murder is Everywhere, where he will join a number of writers who take us to various interesting parts of the world. Novelist and reviewer Sarah Ward of Crimepieces compiles a good list of Scandinavian crime novels in translation for W.H. Smith booksellers. Another novelist and reviewer, Margot Kinberg, takes a spotlight to Carin Gerhardsen’s The Gingerbread House, giving it a thorough and thoughtful analysis. In other not-really-news, I’m still very slowly updating my site. So happy that there are people who are more on top of new things like Karen Meek of Euro Crime and the dynamic duo, Lucinda Suber and Stan Ulrich, who are behind the Stop You’re Killing Me Site. I don’t know what avid readers would do without you and other Internet-based forms of perpetual motion. Norman Rockwell Popular Science image courtesy of Wikipedia. I’m sure some of this blogs’ readers have good things to share. 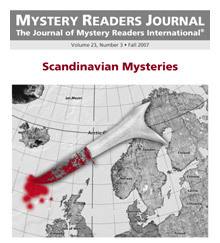 If you’re not familiar with this publication, you may want to browse past issues or check out the 2007 issue devoted to Scandinavian crime fiction. This just came across the radar and may be of interest to the academically inclined. Oh, and we’re talking Nordic crime fiction, not Vikings. The crime genre has a long-established history in the Scandinavian countries: from the ten-part series of novels by Sjöwall and Wahlööfeaturing Inspector Martin Beck to Henning Mankell’s critique of Swedish society through the lens of the Kurt Wallander novels. Since the publication of Stieg Larsson’s The Millennium Trilogy in 2005 featuring anti-heroine, Lisbeth Salander, we have seen the birth of a global phenomenon that has spread across multiple media windows including literature, film and, most notably perhaps, television. Authors such as Jo Nesbo (The Snowman), Lars Kepler (The Hypnotist), Lotte and Søren Hammer (The Hanging) and more besides, regularly feature in book store charts and on internet shopping sites. In the UK, BBC Four continue to champion the genre by airing The Killing, Borgen, and more recently, The Bridge alongside other series, such as Mammon and Arne Dahl. How can we begin to account for the popularity of the so-called Nordic Noir genre in the UK and beyond? How has this impacted other texts outside of the Scandinavian Peninsula? What can audiences and fan cultures teach us about this phenomenon? More simply, why Nordic Noir and why now? The term itself, Nordic Noir, has also grown beyond its initial ambit to encompass multiple genres rather than restricted to crime or the police procedural. Arrow Films releases Scandinavian drama on the Nordic Noir label which includes crime, but also, other genres, such as history (Anno 1790), for instance. In this way, the genre has expanded in significant ways as a ‘cultural category’ that is discursively constructed rather than confined to a limited and finite designation. Following Jason Mittell, the Nordic Noir genre ‘operates in an ongoing historical process of category formation genres are constantly in flux, and thus their analyses must be historically situated’ (2004: xiv). Non-Crime texts (such as Akta Manniskor or Anno 1790 and so forth). Influence and impact in other cultures. The new wave of literature. All proposals will be considered within the remit of Nordic Noir and its impact. Deadlines for abstracts: October 1st 2014. This will form part of the proposal to Edinburgh University Press who have expressed an interest in the project. Abstracts to be forwarded to: billyproctor <at> hotmail.co.uk. Please send any queries, ideas etc to the same. ‘Y Gwyll/Hinterland: Twice-told Noir,’ Bronwen Thomas, University of Bournemouth, UK. My thanks to Brownen Thomas of the Digital Reading Network who pointed the issue out to me. *Sorry if I sound ungrateful. but I get frustrated when all of this valuable work is generally available to so few in order to support T&F’s 35% profit margin. The Spectator has a fascinating article about the origins of Påskekrim, Norway’s tradition of reading crime fiction at Easter. It seems a couple of enterprising guerrilla marketers of the late 19th century placed and ad for their novel about a train robbery that looked very like a news headline in Aftenposten. A tradition was born. As Norwegians head to their country cottages for the holidays, they take candy and entertaining books with them. The article goes on to profile worthy Norwegian writers, Anne Holt and Jørn Lier Horst, as well as a selection of Swedish and Danish recommendations. I have a copy on its way to me, and I am looking forward to it. In an email to me, critic Paula Arvas wrote “it’s one piece of quality crime writing!” She also recommends Pekka Hiltunen’s Cold Courage which will be out in June. For more from Finland, see the website of the FELT Cooperative. At Reviewing the Evidence, there are several Scandinavian crime novels reviewed this week. John Cleal finds Mons Kallentoft’s Autumn Killing complex, dark, splendidly written, and a bit of work for the reader – but well worth it. Yvonne Klein finds some of the plot devices in Silenced, Kristina Ohlsson’s second novel, awfully shopworn, and isn’t taken with the characters, though the book does provide a picture of Swedish approaches to justice. Anne Corey is enthusiastic about Helsinki Blood, the latest brutal and dark entry in James Thompson’s Kari Vaara series. (Thompson is an American living in Finland, where his books were first published.) Though it focuses on Vaara’s attempts to salvage a what’s left of his life after the violence of the previous book in the series, it ends on a hopeful note and a possible new direction for the series. In an earlier issue of RTE, I reviewed Tursten’s Golden Calf, which I felt was a strong entry in the series that has interesting things to say about the way wealth distorts people’s values. He previously reviewed Last Will by Liza Marklund, which he gives top marks, saying it’s an engrossing story that does a good job of weaving together the investigation and Annika Bengtzon’s personal life. Margot Kinberg puts Jørn Lier Horst’s Dregs in the spotlight – part of her series in which she examines how a particular mystery works in depth. This episode is dedicated to Maxine Clarke, who was one of the first to review this book. 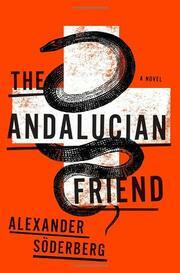 At Crimepieces, Sarah Ward reviews Alexander Söderberg’s Andalucian Friend, which she enjoyed – with reservations. The story’s strength is in its well-drawn characters, but the non-stop action and attendant hype left her wondering what all the fuss is about. More reviews of Söderberg’s novel can be found at The Book Reporter (which finds it an epic powerhouse of a novel), Metro (which is less enamored, finding the female lead lacking and the violence over the top), and Kirkus (which deems it promising but with issues). At Petrona, Maxine reviews the book, finding many of the characters well-drawn, but herself not particularly drawn to Nina Borg. Despite a disappointing denouement, Maxine found the book “exciting and involving” as it sheds light on issues of social injustice. Ms. Wordopolis thought it was the best of the Scandinavian crime she has read lately, with complex characters and a riveting story that never becomes manipulative. At Eurocrime, Lynn Harvey reviews the new translation of Liza Marklund’s The Bomber, which she found a fast-paced thriller with an appealingly strong heroine. The Daily Beast interviews the authors about the choices they made in the book, including the portrayal of men who carry out violent acts. They find crime fiction that dwells on violence is too often about how crime is committed, not who committed it or why. At International Crime Fiction, Glenn Harper reviews Johan Theorin’s The Quarry, writing that Theorin continues to combine an interesting plot structure, lots of the flavor of daily life for the characters, including the recurring figure of Gerlof, an elderly resident of the island of Oland, and a folkloric supernatural element – continuing the arc of a series that he feels is about as far from the style of Stieg Larsson as it is possible to get. He also reviews Helene Tursten’s Night Rounds and compares it to the previously-filmed Swedish television version of the story. He praises Tursten for telling an interesting story with just the right amount of domestic backstory – and Soho Press for restarting their publishing of this seires, which was one of the earliest Swedish translations into English among crime fiction titles. At Eurocrime, Laura Root also reviews Lethal Investments, concluding that plot is less the author’s strength than character and being able to poke society with a sharp, satirical stick. Sarah at Crimepieces also reviews it, noting that it has a slightly bizarre but not implausible plot, praising the author’s writing and ability to create intriguing characters. At Petrona, Maxine has mixed feelings about Kristina Ohlsson’s Unwanted. She found it a quick, entertaining read, but short on emotional depth and rather predictable, though the writing was good enough that she hasn’t written off the author yet. For the Sisters in Crime 25th Anniversary Challenge, Maxine (who has completed two levels of the challenge and is well on her way to completing the expert level) profiles Inger Frimansson and includes Camilla Ceder and Karin Alvtegen among her “writers a bit like Frimansson” list. Michelle Peckham enjoyed Mons Kallentoft’s Midwinter Sacrifice, finding it a slow-burning story with an intriguing lead character. Keishon raises some excellent questions about “the commercialization of Scandinavian crime fiction” – in particular wondering if the trajectory of the Harry Hole series has been influenced by the demands of the American market for more violence done by armies of serial killers. The comment thread resulting is also well worth a read. She also reviews Asa Larsson’s The Black Path which she found an uneven entry in a strong series – making up for it in Until Thy Wrath Be Past, which she found “unputdownable,” full of strong scenes and unforgettable characters. Shadepoint names Leif G. W. Persson’s Between Summer’s Longing and Winter’s End the best book of 2011, which was challenging in its scope but in the end memorable and significant. Kerrie in Paradise finds Jo Nesbo’s standalone Headhunters quite clever and advises readers to stick with it through its slow start. Publishing Perspectives profiles Victoria Cribb, who translates Icelandic works into English and scrambles to keep up with Icelandic neologisms that are based on Icelandic roots rather than being merely imported from other languages. (Go, Iceland!) This small country, which publishes more books per capita than any other, was highlighted at the Frankfurt Book Fair. Dennis O’Donnell, book geek, reviews Barry Forshaw’s Death in a Cold Climate. Forshaw himself blogs at Shots about covering the Scandinavian crime beat – and offers aspiring novelists a checklist of how to write a Nordic bestseller, among the tips changing your name to something like Børge Forshawsen. 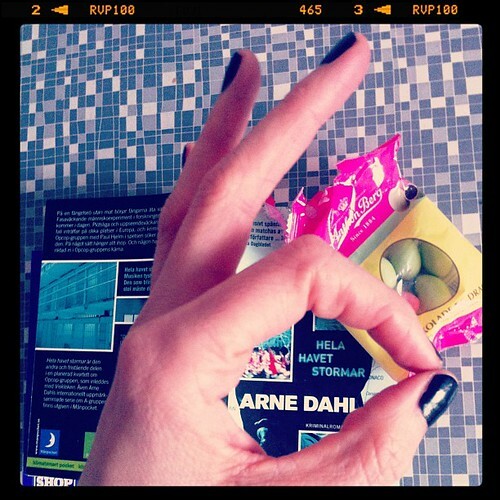 Dorte contributes a wonderful survey of Danish crime fiction to Martin Edwards’ blog, Do You Write Under Your Own Name? including writers who are just becoming familiar to English-speaking readers as well as some we haven’t met (yet). On the “in other news” front, Nick Cohen challenges Stieg Larsson’s claim to feminism, criticizing his (not translated) co-authored book on honor killings which Cohen says suffers from a left-wing abandonment of feminism when race enters the picture, using the issue to accuse leftists in general of waffling on women’s rights when it comes to immigrants. The smoke is still rising from the comments.